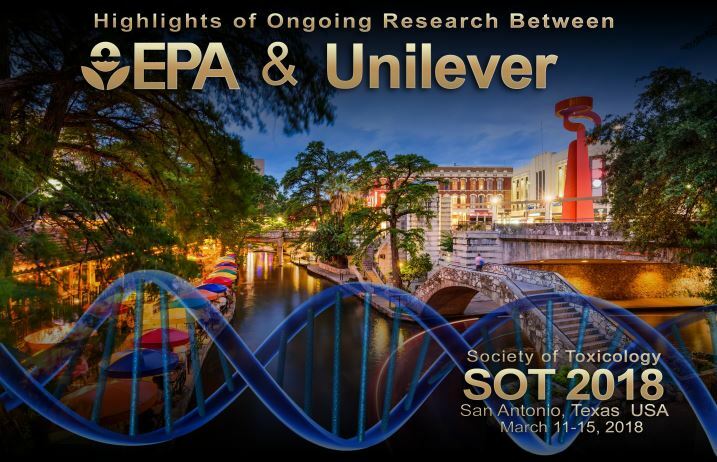 Scientists from Unilever SEAC will be presenting different aspects of our research into non-animal approaches at the annual Society of Toxicology (SOT) meeting in San Antonio, Texas (11th-15th March, 2018). This will include a joint scientific session with the US Environmental Protection Agency (EPA), National Center for Computational Toxicology. US EPA and Unilever are collaborating to use new tools and approaches to build a risk assessment to enable decisions to be made without using animal tests. This session will highlight the accomplishments of the collaboration to date and describe next steps. Evaluation of a Next-Generation Risk Assessment (NGRA) Approach for Skin Allergy Using Six Ingredients and Two Product Exposure Scenarios. ​G. Maxwell, N. Aptula, M. Baltazar, J. Butcher, R. Cubberley, N. Gilmour, C. MacKay, R. Pendlington, J. Reynolds, E. Vandenbossche, and C. Westmoreland.